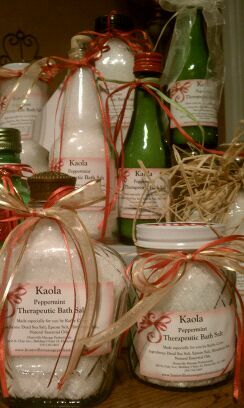 Made especially for you by Kathy Curry, owner of Huntsville Massage Professionals. While filling the bath, add 1 cup of bath salts. Indulge yourself and soak for up to an hour. Wash and rinse after soaking and feel renewed, refreshed and relaxed. Great for a refreshing foot soak as well! Lavender promotes feelings of contentment, improved cognitive performance and has mild sedative and calming effects. This aroma promotes sleep and reduces cortisol levels. Jasmine has a strong but sweet, pleasing and romantic fragrance, which is very common in those flowers which bloom at night. The aroma of this oil has a pleasing, uplifting effect on mind and fights depression. Peppermint increases memory and alertness; is excellent for mental fatigue and depression;. for energy and brighter mood; reducing pain; to help breathing; improve mental clarity and memory; alleviate pain from headache and migraine; relieve nervous stress, vertigo and faintness. Reduces stress, reduces muscle aches, promotes relaxation and sleep. Eucalyptus can relieve fever and skin irritations; is renowned for treatment of respiratory complaints; head-clearing; uplifting; refreshing. Spearmint is effective for clearing the respiratory tract and as a decongestant and expectorant. Rejevenates and refreshes when you are feeling sluggish, anxious, depressed or simply exhausted. Lemongrass acts as sedative on the central nervous system, relieves muscular pain and increases circulation. Kills some viruses, bacteria, fungi and yeasts, boosts enenergy and endurance, relieves pain and irritation caused by hemorrhoids, reduces inflammation, supports tissue healing and repair. Frequently used by professional athletes, Relieve sore muscles with the natural power of Arnica, a mountain-cultivated herbal powerhouse that acts as a potent anti-inflammatory and circulation booster. Used to relieve strains, sprains and bruises, Arnica assists normal healing processes, relieves muscle tension, stops aches and pains in their tracks and accelerates wound healing. Alleviates muscle pain, improves memory, boosts the immune and circulatory system﻿.. Perfect for those who prefer unscented or have allergies. Ingredients: Natural Dead Sea Salt, Evaporated Sea Salt, Himalayan Salt, Epsom Salt.